#1 in Sports Team and League Management Solutions since 1998! Create Your FREE Web Site Now! Fan Shop Every LeagueLineup site comes with a FREE Custom Fan Shop! Receive Up to 15% Commission on Every Sale! Start your Fan Shop Earnings Today! PHOTO ALBUMS Create unlimited number of photo albums. Upload photos from games, practices, special events. STATISTICS Detailed statistics are available by Player and Team for Baseball, Basketball, Football, Hockey, Lacrosse, Soccer and Volleyball. 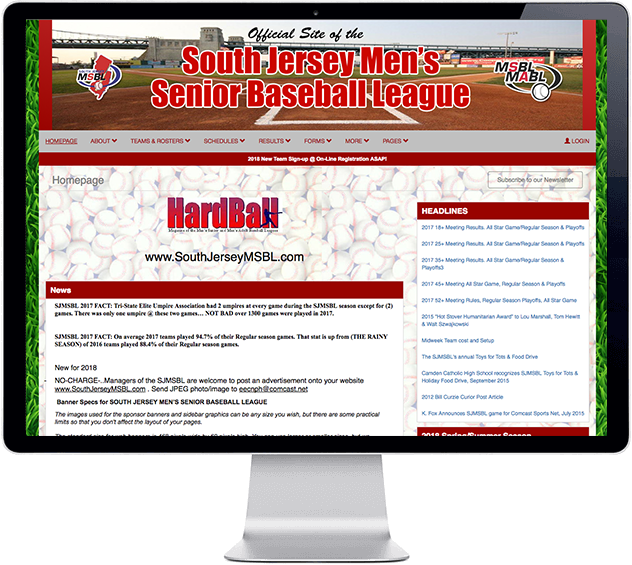 With a clean design and bold colors, the South Jersey MSBL has created a solid website for their league to disseminate information to their players and teams. They have also made use of our Free Online Registration feature allow their players to register for the upcoming season. The Young Knights have used our web development tools to come up with an interactive team website. The most used features on the site include the Team and Player Statistics, Calendars and Photo Albums. Swish Atlanta has found a great solution in LeagueLineup when it comes to keeping their members updated about the latest news on youth camps, group coaching, competitive club teams and more. 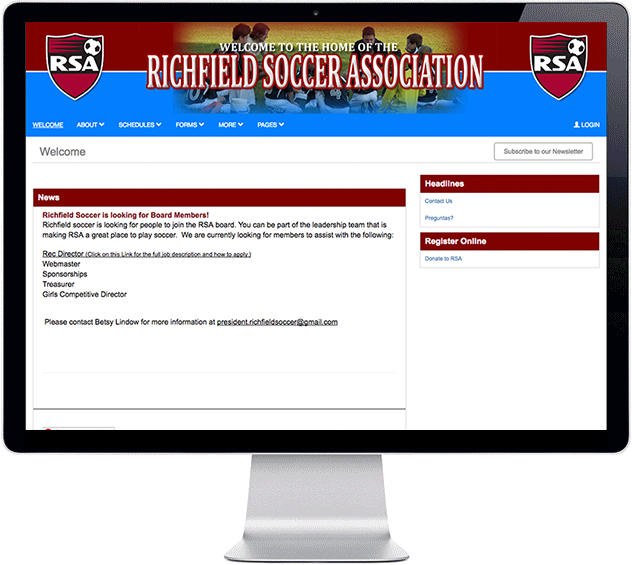 The Richfield Soccer Association is a soccer club that mainly caters to players between the ages of 9 and 18. Through the creation of a sleek-looking and informative website with us, they have attracted more fans that can now follow their development online. 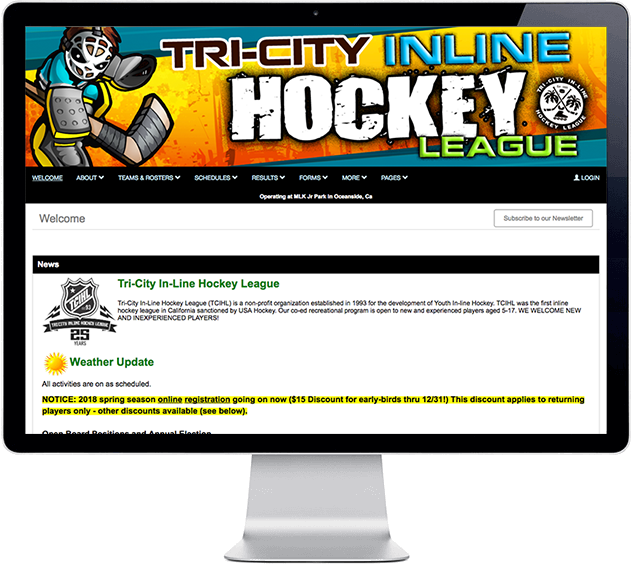 The Tri-City Inline Hockey League has been in existence for more than 18 years. The mandate of the league is to mainly promote the development of youth inline hockey. Courtesy of LeagueLineup, the league has developed a website that is really cool! 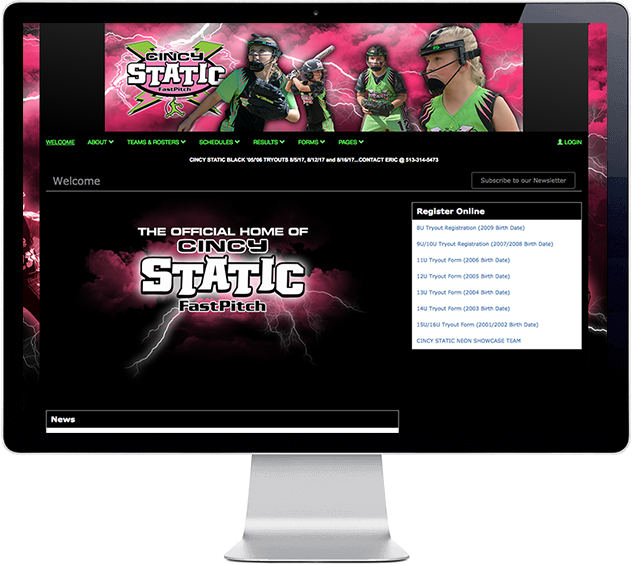 Cincy Static Fastpitch is a softball association that promotes fastpitch softball for girls from 8U to 16U. LeagueLineup has been chosen for their online home, and we have helped them to build an easy to use website loaded with plenty of nifty features. 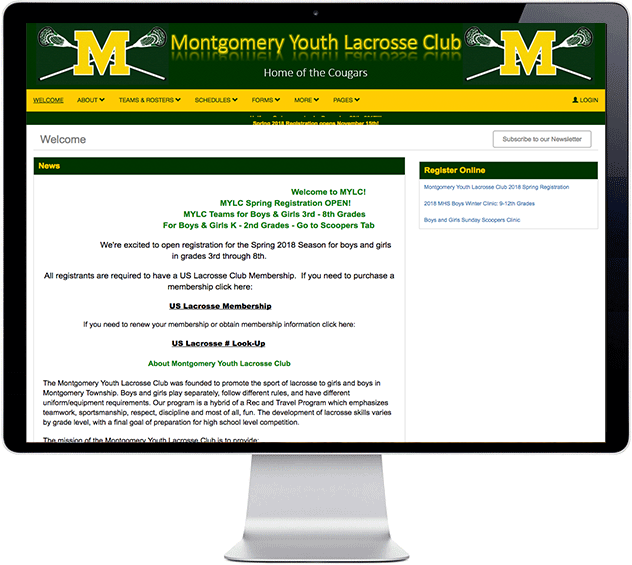 The Montgomery Youth Lacrosse Club wanted a user-friendly website to carry out their club administration and that's why they have made LeagueLineup their home. By tapping on features such as Schedules, Game Results and Photo Albums, Montgomery Youth Lacrosse is able to showcase their team events as well as share information about their activities online in an easy manner. 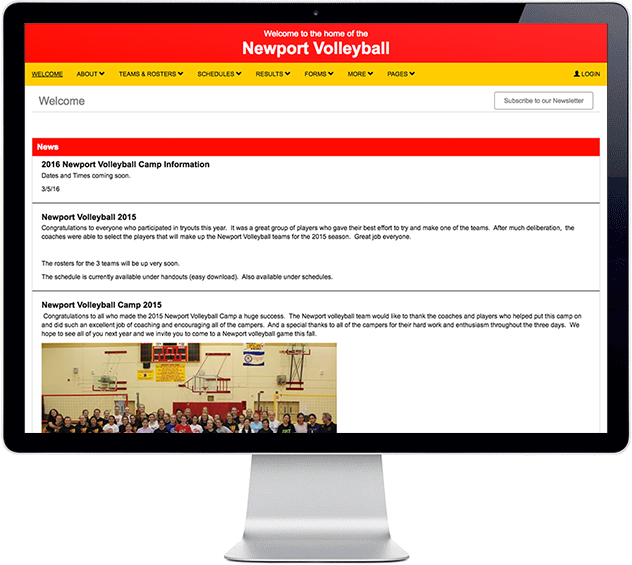 Newport Volleyball is fully committed to developing volleyball skills in its athletes. 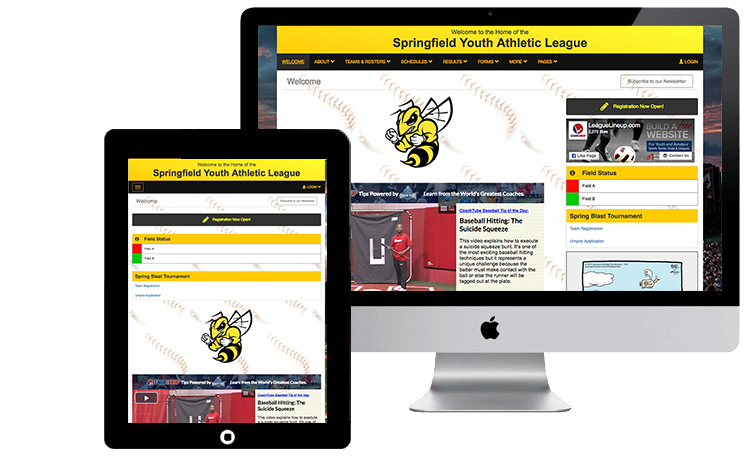 With the help of LeagueLineup, they have set up a website so that they can communicate club news, events, activities, and competition results with their players, parents, and fans among others. Great for ALL Sports and Organizations of Any Size and Age! Youth, Adult, Intramural, Club, etc. Upgrade to send Text Alerts, Email Blasts, get Additional Diskspace and more. No Ads! Remove ads from your site and get a custom Site Header featuring your logo, colors and organization name! Every site comes with a custom Fan Shop featuring over 500 customizable products. Earn up to 15% on each sale! Orders delivered directly to your members! Bookmark your favorite LeagueLineup sites, receive Schedule Reminders and more. ATTENTION PARENTS! Great for combining schedules from multiple LeagueLineup sites! NO SETUP OR ACTIVATION FEES And No Contracts! EVERY SITE INCLUDES STATISTICS FOR TEAMS AND PLAYERS! Find Youth and Amateur sports organizations near you!